While we do everything within reason to make your trip as safe and enjoyable as we can, there are challenges implicit to travelling in the world's mightiest mountains that we could not remove if we wanted to. The environment is very much in charge here, the natural forces so great that human endeavours to tame them barely register. The Himalaya is still growing, and at the same time collapsing, possibly overnight and across our route. For this reason no itinerary is ever set in stone. Each morning your tour leader will gather information and assess conditions ahead. If our planned route is blocked, we may have to detour, or wait until a passage can be forced. If this happens it is usually overcome, but there is the possibility routes and accommodation will have to change. This is not a normal package holiday, but if you're looking for the ultimate biking adventure, with the best back-up and most fitting overnight accommodation, then you'll love it. As a participant in this tour you'll fly to Delhi International, before transferring to the nearby domestic terminal, where you will board for the spectacular (approximately hour-long) flight up to Ladakh. In Leh you will be met by Blazing Trails staff. You'll be handed 'your' bike, a 500cc Enfield Bullet (with a front disc brake) and given instruction on its eccentricities. There will be a full briefing before we set off into the high mountains. When riding there will be a leader and 'outriders' guiding and trouble-spotting. A 'sweeper' rider and a support vehicle with an extensively-equipped medic will travel at the rear. Roads are often rough, so we recommend you have at least two year's riding experience before taking on this challenge. You will also need reasonable fitness and there are certain medical conditions that preclude travelling at altitude, so check with Blazing Trails and your GP if in doubt. Weather ranges from warm in the lower valleys, to conditions similar to a UK winter's day up high, rarely including snow. Travelling up in these beautiful mountains by bike brings you close to the environment and its inhabitants; close to the nature of this huge place. For most riders a trip like this will be the experience of a lifetime. Ladakh is a sparsely-populated area of lofty mountains and high desert plains in the Indian Himalaya, part of the state of Jammu and Kashmir. Once a major intersection on the Silk Route, it is now bordered by Chinese-controlled Tibet to the east and Pakistan to the north. Currently all Ladakhi border crossings to these countries are closed. The indigenous population are mainly Buddhist and are culturally close to Tibetans. Ladhakis traditionally carved out a tough existence through agriculture, shepherding and trade, but now the tourist industry also provides income. Ladakh is the coldest inhabited place on Earth, after Siberia. The entire region around Ladakh's capital, Leh, is cut off by road from mid-October to late May by snow and landslides. Much of Ladakh is situated above 10,000ft in altitude, being part of the Tibetan Plateau (Ladakh is known as 'Little Tibet' and has often been part of that Kingdom). The Great Himalaya to the east provides a rain shadow, beyond which the easterly monsoon should not pass (although very occasionally it seems to). The lack of precipitation means less snowfall than other areas of similar altitude and it is this that has allowed the building of most of the planet's highest roads in Ladakh. Winter temperatures fall as low as -35ºC, but in summertime the climate is mild, ranging from around 30ºC to 15ºC in the daytime and rarely dropping below 5ºC at night. Zanskar is a little-visited river valley between Ladakh and Kashmir. Until 1974 the valley was entirely off-limits to foreigners and subsequently tourism has been low-key, as access in and out of the capital, Padum (population 700), is via some 90 miles of rough road, which crosses the formidable Pensi La (14,450ft). This road was not 'constructed' until 1979. The mainly Buddhist population of the valley is only around 14,000-strong and most people eke a living through rearing livestock and small-scale cultivation of summer crops. In wintertime the only route in and out of the valley is along the frozen Zanskar River. The mountain ranges and rock formations surrounding Zanskar are among the most spectaular to be seen anywhere. The huge twin Nun-Kun peaks (both over 23,000ft) and the glaciers issuing from them dominate the scenery above, while the sparkling blue river froths below the road. Zanskar feels like some kind of lost world, very remote and, with traffic being almost non-existant, extremely peaceful. There is a plan to link the southern end of the valley with the main Manali-Leh highway and when this happens, everything is likely to change. Zanskar is then likely to become part of a busy tourist circuit. But for now, this valley reamins one of the most remote places you can visit on a motorcycle. Fly into Delhi, where you will transfer the short distance to the domestic flights terminal to meet your connecting flight to Ladakh. From Delhi it is a short (approximately one hour), but visually stunning flight over the snow-capped mountains of the Himlaya that will deliver you to Leh. Here you will be met by the Blazing Trails staff and transported to our hotel base. Rest and gentle exercise is what you will now need, as the acclimatisation to altitude begins. As you'll have flown in to an altitude of over 11,000ft, taking things easy is a must. Spend the morning taking a gentle walk into town to shop, eat and visit the sights. This large, history-drenched town was the capital of the ancient kingdom of Ladakh. It is set at nearly 12,000ft above sea-level in the Upper Indus Valley and like all Ladakh its culture is principally Tibetan Buddhist. There are, however, also Muslim, Christian and Hindu communities in Leh and throughout Ladakh. Overlooking the town is the huge, nine-storey Leh Palace, long since abandoned, but still impressive and worth a visit. There are many more ancient temples and monasteries to visit and the old Leh market is a fascinating experience. A full day's riding will take us along the Leh-Srinagar highway and wind madly over the Fotu La pass (13,479ft). The ride is fabulous. At the town of Kargil we head south down the Suru Valley. As we steadily ascend beside the river, the countryside gets wilder and the tarmac ends. The huge Nun-Kun mountains rise above the road and glaciers come down to within metres of the road. We end the day at a fixed camp at Rangdom, again a monastery village, this one in an extremely special setting. Rangdom is set in a wide river valley, with huge (up to 23,000ft) mountains rearing on either side, spewing glaciers, with huge folded rock formations at either end. Colours are permanently shifting with the light until nightfall, when it gets a little chilly and your sleeping bag may be a welcome back-up to the quilts provided. Today is yet another breath-taker. From Rangdom, again on unpaved roads, we will start by scaling Pensi La, which at 14,450ft is far from the highest point of the tour, but with a view down onto the huge ice motorway that is the Nun-Kun glacier it is quite some highlight. Following the descent, we are in Zanskar proper, chugging through small villages with hairy livestock looking on from the fields. When the valley opens out towards Zanskar's capital, Padum, the feeling is like that of stumbling upon a lost world. Villages of whitewashed Tibetan-style houses cling unfeasibly to the mountainsides and every few yards there's a shrine to catch the eye. A rest day in which to walk around, taking in the place. In the afternoon, we will have a short ride-out to one of the cliff-side villages, Karsha. Here we will walk up to the monastery through the tumbledown village and watch the shadows grow across the colossal valley below. As there is only one road into Zanskar, we have no choice but to reverse the route out. So we will, all the way to Kargil. We return down the Zanskar and Suru Valleys, riding at first in the high mountain scenery and surrounded mainly by Buddhist culture and then, in slightly gentler terrain, through scattered Muslim villages. The town at which we will be stopping the night is not very interesting, to be honest, but it does have a decent hotel, so that's where we'll stay. An easier ride than yesterday, back up the Indus Valley to Leh, with the river raging beside some of the finest twisties the planet has to offer. We will start the day riding up to the Khardung Pass (which holds the title of the 'World's Highest Motorable Road') for a cup of chai and some stunning views. At over 17,500ft you'll be short of puff, so it will be a quick stop before we head down the other side of the pass and descend to Khardung village. This is a very isolated area, the road only having been opened to traffic as recently as 1984. From Khardung the scenery opens into some of the most magnificent views imaginable, and the vast Nubra valley. Nubra, being bordered by both China and Pakistan, is of great strategic importance and outsiders are not allowed beyond the village of Hundar. It is in this furthest accessible village that we will stop for the night, sleeping comfortably under canvass in the peaceful grounds of a disused Buddhist monastery. A day to soak up this extraordinary and magical high-altitude (though a little lower than Leh) valley. There are plenty of walking tracks, monasteries and prayer caves to explore. There is also the option of going for a camel ride - Nubra is one of the last remaining outposts of the Bactrian (two-humped-and-shaggy) camel and a few ply the pristine sand dunes close to our camp at Hundar. Come nightfall this is an amazing venue to star-gaze through the bottom of a beer glass. From Nubra we will take a new route, only completed in 2010, from Nubra to the equally impressive Changtang Valley. More sinuous tarmac will bring the deep blue Pangong Lake into view, alongside which we will ride until we arrive at our camp, which is as far as the road towards Chinese-infested Tibet goes. Again, the beauty of this destination borders on unfeasibility, the quality of the high-altitude light being reflected from the salt water giving the area an otherworldly feel. From Pangong it's a steady climb up to the second highest pass of the tour, Chang La. This place is less visited and has a more remote feel than Khardung, while being all but its match in loftiness. The descent to the main Manali-Leh highway is yet again entertaining thanks to the serpentine road and awesome views. We end the day at the Monastery village of Tiksey with time to tackle the short but steep climb up to the monastery complex for sunset. More on Thiksey. If you missed out on the monastery yesterday, you'll have a chance to visit in the morning before we set off on the short hop back to our Leh hotel. There should be time for some evening shopping before dinner. That's it folks, you've done it (we hope), crossed the World's two highest motorable passes, seen huge glaciers, ridden by high-altitude lakes and immersed yourself in the colourful cultures of Ladakh and Zanskar. Time to board the early morning flight back to Delhi and thence home. Back on western turf you won't be able to explain the scale of this journey; photographs and videos will fail to do justice to the adventure in which you have been involved. Lucky then that memories are made of epic adventures. You should be able to get by on around £300 spending money if you don't do a lot of shopping. You may want to change a little money (about £30) at the airport, but check the rate before changing a large amount. Cash and travellers' cheques are easily changed in Manali and Leh (where there are also cashpoints), but nowhere else on the route. While you don't have to be an athlete to join us on this adventure, we would not recommend this tour to those who cannot, for instance, climb a flight of stairs without puffing and blowing. Please note that there are some long days in the saddle. We reach some great altitudes on this tour, so if you have any existing medical condition, please consult your doctor and Blazing Trails before booking. To the top of the world - mind-blowing riding and views. Roads have improved in recent years, but this tour visits the Suru and Zanskar valleys, whose roads are unpaved, offering three fairly tough rides, probably with river crossings. Other high passes (up to 17,550ft) are likely to be rough at the tops. However, we have taken scores of people on this route, up to 70 years-old, so it is achievable to the average rider with a bit of teamwork and effort. A challenging tour for pillions (and riders with pillions) in some places. Much of the route is smooth tarmac, but others are rough and sometimes rocky. However, if you're a bit of a hard-arse who must see these most remarkable places, then it' not impossible and the back-up truck is always there if you need a break. The venues and views are five-star, but although the accommodation is the best we can find in the area, choice can be a little restricted on the edge of where it is possible for humans to exist. Food (mainly vegetarian) is simple, except in Leh, where the tourist industry is more developed. Included meals: all breakfasts; 1 dinner. Dining is extremely inexpensive. 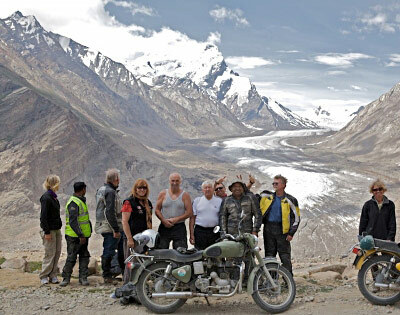 The world's highest rideable passes - Khardung La, Chang La and may others, including the glacier views at Pensi La. Lamayuru Monastery; the mind-boggling high mountain views in the Zanskar Valley; Zanskar monastery visit; the markets of Leh; high-end camping and Bactrian camels in the serene Nubra Valley; amazing high-altitude Pangong Lake.